My blood sugar reads normal at nights but the longer i fast, the higher it reads in the mornings. Does my gallstones have anything to do with blood sugar reading? p.s. when i eat, it goes back down after about two hours. Regarding your health condition, I could say that your high blood sugar level has lead to gallstones; however, I do not know for how long you have been diagnosed with diabetes or whether you have been diagnosed first with gallstones or diabetes. In either cases, diabetes is one of the risk factors for gallstones or gallstones could be the first symptom for diabetes. 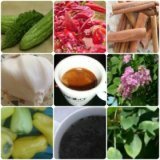 Besides, I do not know the exact situation of your gallstones, their size, their position in the liver and hepatic channels, their properties; or other problems you might have. With regards to your high fasting blood sugar levels, I could say that there are many factors contributing to keeping them high, out of your control. 1. One of them include "Dawn Phenomenon", where many morning hormones (also called stress hormones, i.e. cortison, epinephrine, norepinephrine) are exctreted first thing in the morning to give your body a boost of energy for the new day. 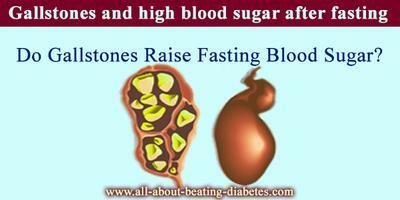 But, in cases like yours, your body can not make it to bring the blood sugar down again. Growth hormone is another culprit, however, the younger the person, the higher the effect of this hormone. Another factor could be the "counterregulatory response" or as they call it "Somogyi Effect". This is the case when your blood sugar levels could be down, and the body catch this as a dangerous signal of low blood sugar level. Therefore, it mobilizes all the hormones and other stress substances to raise blood sugar, impeding hypoglycemia onset. This phenomenon will cause you very high blood sugar levels. You are saying that after 2 hours you take your meal, your blood sugar goes down again. This means that your beta cells are producing functional insulin. As conclusion, I could say that "Somogyi Effect" is most explainable to your case. However, please consult your doctor for more accurate advice as I do not have your data from your medical record. How can you prevent your blood sugar to go high?